Reviewed: Beefsquatch! (Kidrobot, 2017) | 'TAIN'T THE MEAT… IT'S THE HUMANITY! 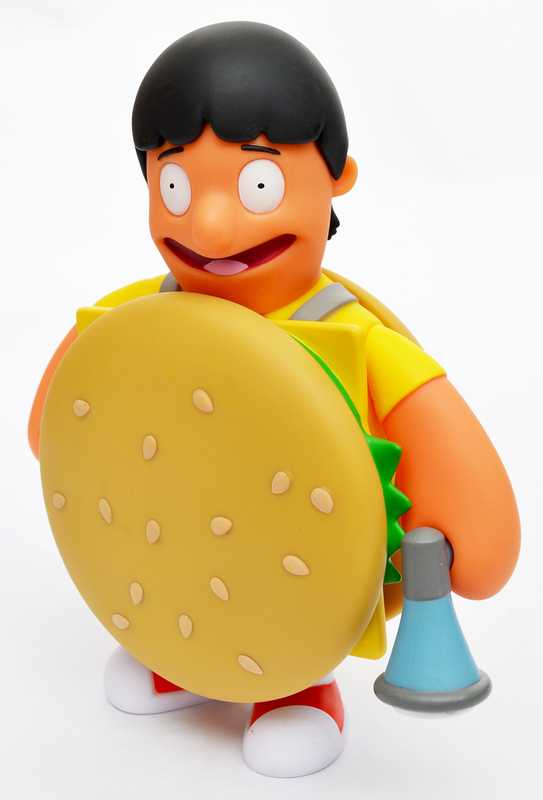 Gene Belcher — the fart-obsessed middle child from animated hit Bob’s Burgers — received the coveted oversized vinyl figure treatment from Kidrobot in 2017. Behold: Beefsquatch! Since it’s debut in January 2011 Bobs Burgers has been somewhat of a sleeper hit for Fox television. Over eight seasons the animated adventures of the Belcher family — parents Bob and Linda, and their three children, Tina, Gene and Louise — has gained a fiercely loyal fanbase. The show deftly mixes comedy and realism to create a show that is both entertaining and enduring. Bob’s Burgers has now become so successful that a ninth season has been green-lit, and a theatrical movie is planned for Summer 2020. Beefsquatch! This is me now! Created by Loren Bouchard, who was also responsible for indie hits Home Movies and Dr Katz, Bob’s Burgers features one of the finest voice casts on TV. The terrific H. Jon Benjamin plays Bob, owner and chef of his own burger restaurant; John Roberts plays his bubbly wife Linda; Dan Mintz portrays boy-and-horse-obsessed older daughter Tina; Eugene Mirman plays middle-child Gene while Kristen Schaal voices bunny-ear-wearing youngest child Louise. Because Gene’s Beefsquatch mask is removable, this feels like two toys in one. 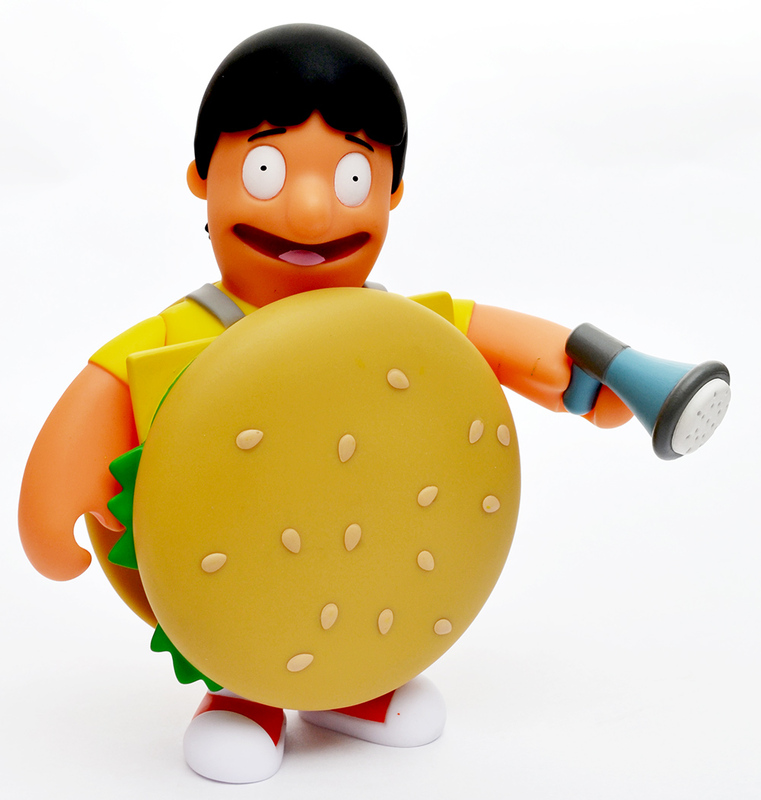 Due to the success of Bob’s Burgers it’s hardly surprising that vinyl toy maker Kidrobot would choose to release collectible figures based on characters from the show. Two collections of three inch toys (sold in blind boxes) have been released so far, as well as four oversized editions: Bob in his Equestranaut Bobcephala outfit; Tina, and her bad girl persona Dina, and Gene in his Beefsquatch outfit. 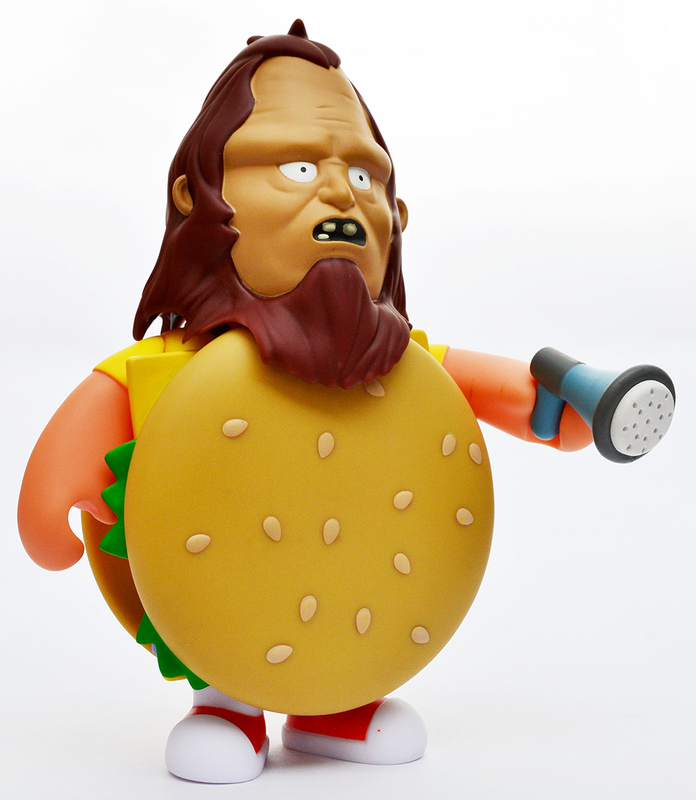 (Beefsquatch originally appeared in the last episode of season two of Bob’s Burgers, broadcast on 20th May 2012). Beefsquatch measures just over eight inches in height and is made from sturdy, painted moulded vinyl. The toy ships in a cardboard display box and comes sandwiched between two pieces of clear blister packaging. 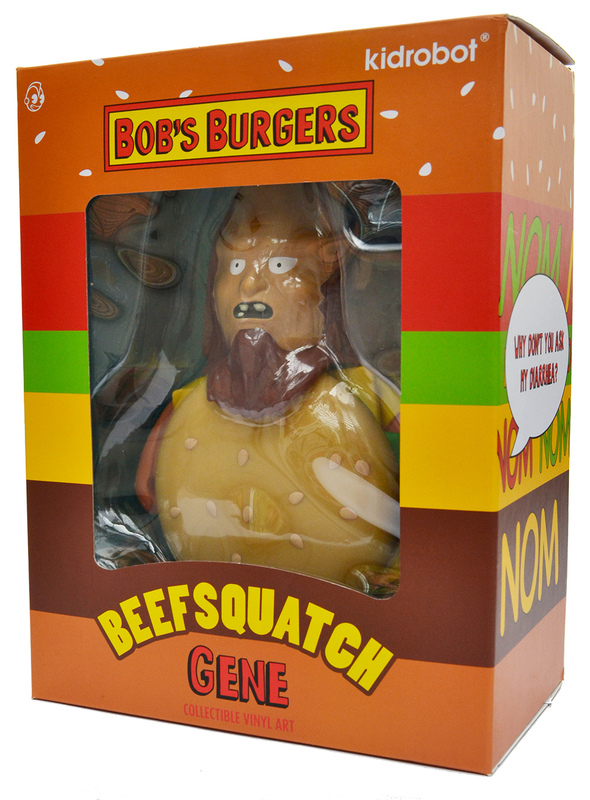 The figure depicts Gene in his burger outfit and his Beefsquatch mask is removable, revealing the adorable little scamp beneath. 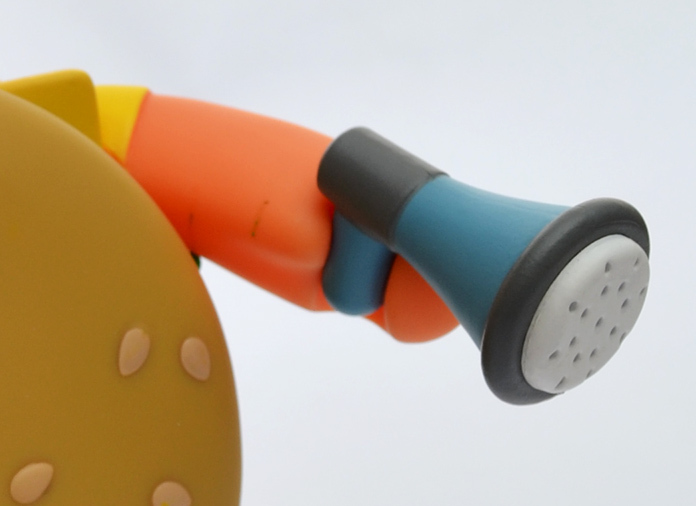 The figure also comes with Gene’s beloved megaphone. The toy is well-made, and is easily up to Kidrobot’s high production values, while the paintwork is also of a very high standard (with one caveat, which I discuss below). Although this figure is very well made, and a welcome addition to my Kidrobot collection, I do have a couple of quibbles with Beefsquatch. First off, the box artwork is a little dull and uninspired. Compared to some of Kidrobot’s other oversized vinyl figures (Homer Simpson’s Buddha takeaway box leaps to mind) the artwork and design of the box just feels a little flat. Saying that, the ‘Designed with Farts’ reference on the bottom of the box is a nice touch, and greatly appreciated. Secondly, some of the green paint from Gene’s burger outfit has rubbed off onto his right arm. It’s a small defect, and not too noticeable, but it’s there nonetheless. Some green paint had rubbed off onto Gene’s arm. Beefsquatch was released in early 2017 and is still readily available. It RRP’s at $49.95 (£38), but hunt around and you’ll find it cheaper — I found mine on ebay for £25. Kidrobot also released an alternative purple colorway edition, which is now out-of-stock; personally, I prefer the version shown here. I’ve been a big fan of Bob’s Burgers since it’s first episode. I find it’s balance of character-driven comedy, combined with realistic, recognisable situations to be utterly charming and hilarious. I’ve no doubt the show will run for many more years to come, and hopefully we’ll see Beefsquatch make another appearance before long. 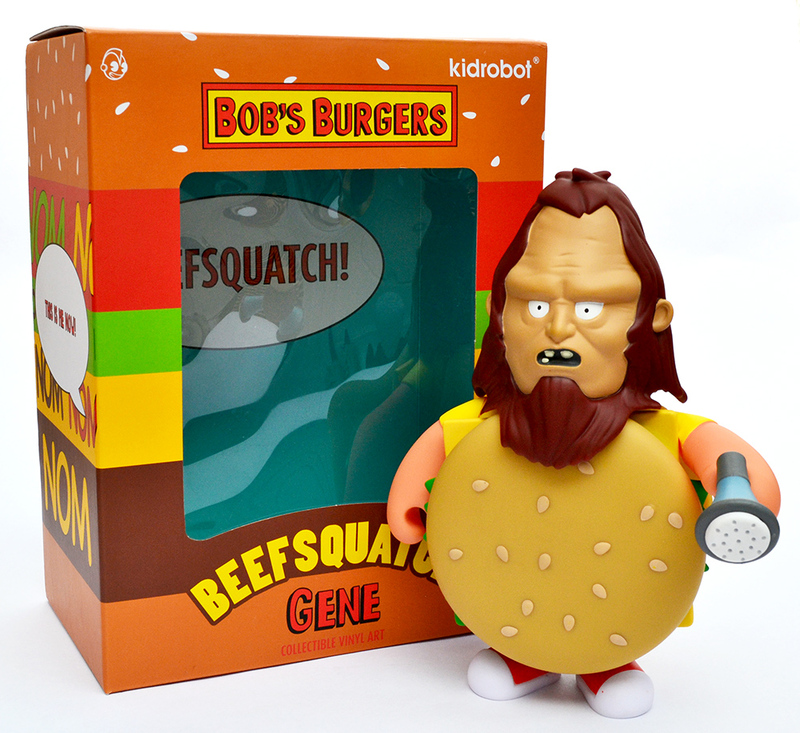 Until then, this charming Kidrobot toy should satisfy my Beefsquatch itch.